Best wishes on your plans… I’m swamped with current demands so I won’t add more just focus on what’s at hand. 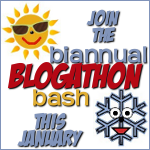 The Blogathon was great. It sounds like you got done what you really wanted to.